Much has been written about the war, but very little about the island base, Ascension Island, which was crucial to our success. This book explains how the island was an essential stepping stone in the execution of a daring plan in response to Argentinian aggression. ...Lack of facilities required much improvisation... which was accomplished with commendable dedication and good humour by our armed forces. The previously untold story of how Ascension Island was crucial to the success of British operations during the Falklands War. The book spans the length of the Falklands War and tells how a facility consisting of next to nothing was turned into the advanced logistic base for one of the most daring and successful displays of military force at long range in the reclamation of British interests. From an island which was largely devoid of all resources, the story of how Ascension Island became the Forward Operating Base, doubled its population in a few weeks and briefly became the busiest airfield in the world – 350 take-off and landings in one day – makes fascinating reading. Air-to-air refuelling proved itself to be a vital force extender throughout Operation Corporate since reconnaissance aircraft had insufficient fuel to return to base. The author, Commander of British Forces Support Unit, has collected together the accounts of several of the main participants including the Royal Navy and Royal Marines, the Royal Air Force, the Royal Engineers and also the American Airfield Commander where the willing co-operation of the United States is underlined. These include the Royal Navy Regulators and the Amphibious Task Group detailing the various logistic problems and how these were overcome. A civilian viewpoint on the impact of such a huge influx of military personnel on the civilian population is given by the head of the resident BBC staff and other St. Helenian residents. 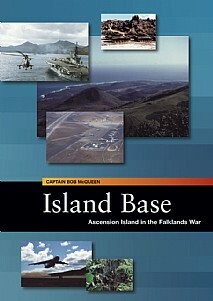 Island Base provides an authoritative overview of this recent conflict which will be of wide appeal. Island Base will be of immense interest to anyone interested in modern history, maritime warfare, and the stunning photographs provide a fascinating pictorial record of all aspects of the Falklands War in relation to the Island.